The Czech Heritage Museum and The Beltonian Theatre will present “In The Shadow (Ve Stinu) for the Czech Film Night Series at 7 p.m. on January 15 at The Beltonian, 219 E. Central Ave, Belton, Texas. Admission is free. Donations accepted. Imported Czech beer available. The 2012 film was selected as the Czech entry for the Best Foreign Language Oscar at the 85th Academy Awards. Starring Ivan Trojan and Sebastian Koch, who played the villian Komarov in “A Good Day to Die Hard” with Bruce Willis. “In The Shadow” opens in the style of a film noir from the '50s, with handsome, dark-toned cinematography (by Adam Sikoba) of a couple of crooks stealing a cache of jewels. When the police come in to investigate, Captain Hakl (Trojan) suspects that something more than a simple robbery is involved. Not rated, but this film is not suitable for children as there are moments of offensive language and some violence, typical of a detective, crime film. No prolonged scenes of violence or language. The movie, directed by David Ondricek, received ten Czech Lion Awards, including Best Director, Best Actor in a leading role, (Trojan), and best cinematography (Sikoba). The new installation is a stunning portrait of the two first presidents and liberators of two Czechoslovakias. T.G. Masaryk and Vaclav Havel. There will be a brief talk on the two men plus a chance to meet the artist, Lisa Chase. Chase specializes in portraits and murals. She holds a Bachelor of Fine Art from the University of Houston. Czech Film Night featuring "Beyond the Wall"
“In our schools, do you know when the history is finished? 1945. More than 90 percent of the young population know absolutely nothing; and that’s dangerous. “Beyond the Wall” is a documentary that looks at how the abrupt political changes of the 1980s affected Central Europeans. The fall of the Berlin Wall in November 1989 symbolized the end of the Cold War and spurred on the peaceful revolutions that caused Communism to crumble. Using period film footage and on-camera interviews, film makers Rob Dennis and Mark Byne uncover the complexities of living under totalitarian rule. Featuring dissidents, artists, escape organizers and ordinary people in Germany, the Czech Republic and Poland, ‘Beyond the Wall” humanizes life under Communism and highlights the complex issues that still face the region. “The stories of living in a totalitarian country are often complicated and dichotomic,” said Susan Chandler, director of the Czech Heritage Museum in Temple. “People had their basic needs met - housing, a job, food, healthcare, vacations. One could live a decent life if they did not think too hard about it. Which made it most difficult for artists, scientists, philosophers and anthropologists. Art was heavily censured. Science was sacrificed to popular doctrines. Free thinking was criminal – people were jailed for it. The activities of outside cultures were debunked. Travel was strictly regulated. “Free education was provided to some but could be easily denied. If your grandparents had been a bit middle class under the free democracy period, by owning a few acres and farming it, or if your third cousin had left during the Prague Spring in 1968, that could disqualify even a devout communist from a college education, even in 1988, regardless of excellent test scores and school records. “It was dangerous to question the obviously absurd ideologies, systems and regulations, so people found ways to survive, psychologically. Therefore young Czech artists such as Vaclav Havel wrote in the genre of the theater of the absurd. It was the actual matrix in which they were living. These works were smuggled out to the West, which eventually brought help,” Chandler said. “From what our European visitors to the Museum have been telling me the last few years, knowledge is once more in jeopardy. They tell me that people are forgetting – or never knew – how things were under communism,” said Chandler. Alice Lunakova will speak on the critical events in the last 100 years of Czech history. Each event has the common ground of occurring in a year that ends in eight. Alice is a graduate student at Masaryk University, Brno, Czech Republic. She was an exchange student at McLennan Community College in 2014. The following year, she conducted research at the Czech Heritage Museum in Temple for her bachelor’s thesis. After graduation, Lunakova presented her thesis on Czech immigration to Texas during the 19th century for a lecture tour which included the Czech Heritage Museum, Temple, , The Texas Czech Heritage and Cultural Center in La Grange, The Czech Center Museum in Houston, Texas A&M University and Baylor University. Learn to play the Czech card gameTaroky! Learn to play Taroks at the Museum! We play the Czech (Moravian) version of this game, but is a very old card game played several European countries. This website even mentions Temple in this description of the game! The Czech Heritage Museum & Genealogy Center will offer Czech language workshops taught by Lt. Ethan Gleue. First Lieutenant Ethan Gleue is an Attack Platoon Leader and Apache Pilot with Charlie Company, 1-227th Attack Reconnaissance Battalion, 1st Air Cavalry Brigade, 1st Cavalry Division assigned to Fort Hood, TX. “I love studying the Czech language, experiencing Czech culture, and sharing that with others. The Czech Heritage Museum provides a great venue to share that love and support a worthy organization,” said Gleue. Ethan served a two-year mission trip in the Czech Republic and Slovakia where he learned Czech and Slovak. He lived in several cities throughout the region including Ostrava, Prague, Olomouc, Brno, Zlin, and Banska Bystrica. Ethan has returned to the Czech Republic and Slovakia several times, including a summer semester at Charles University in 2014. Most recently Ethan returned from a 9-month rotational deployment to Europe with the 1st Air Cavalry Brigade where he traveled to the Czech Republic and other neighboring countries to train with NATO allies and deter Russian aggression. Workshops are free. Donations are appreciated. Main Topic: Czech Alphabet, pronunciation and numbers. Subtopic: Czech geography and accents. Peter Vodenka presents "Journey for Freedom"
Czech Film Nights are on Second Tuesdays of the Month. Admission is free. Donations appreciated. Concessions available, including gourmet foods, coffee, wine and beer including local brews, Czechvar and Shiner Bock. “The Stand-In,” written by Ladislav Smoljak and Zdenĕk Svĕrák, features the fictional Czech personality, Jara Cimrman. This comedy centers around a traveling troupe of actors which finds itself lacking one player. They invite the famous Czech actor, Prachensky, to stand in for the part. However, Prachensky surprises his fellow players and chaos ensues. The Jara Cimrman genre was created by Smoljak and Svĕrák as a radio show in Prague during the 1960s. It is often compared to the British Monty Python series and is considered an icon of Czech humor. Although the Cimrman plays have been performed for around 50 years, the genre still finds popularity with Czech audiences today. In 2005, the fictional character Jara Cimrman was voted "Greatest Czech." Until recently, many did not believe that the plays could be translated successfully to any other language because its humor is so typically Czech. Even non-native Czech speakers often had difficulty understanding the complicated wordplay, historical references and inside jokes. This spring, The American Czech Theatre brings Andrew Robert’s translation of this unique Czech play to audiences. The production will tour across three Texas cities ending with a final performance in New York City. As a Texas based company, TACT brings artists from various backgrounds, hoping to connect audiences to their theatrical heritage. Executive Producer: Sarah Wilhelm. Associate Producers: Conner Skinner, Casey McClellan, Susan Chandler. Artistic Director: Sarah Reynolds. The Czech Heritage Museum & Genealogy Center will host an open house from 10 a.m. to 4 p.m. on Wednesday, February 14. The event celebrates a new exhibit sponsored by the Antique Glass Club of Temple, featuring early 20th century Czech boudoir glass from the collection of Rosie and Danforthe Bodien. Admission will be free during the event. The new exhibit will be displayed in two new cases donated to the museum by the Antique Glass Club and Carolyn Coufal. Boudoir glass refers generally to items found on a woman’s dressing table. This collection includes perfume bottles, cologne atomizers, dresser boxes, ring trays, hat pins and figurines, all made in Czechoslovakia. Several of the new exhibit pieces were made at the Curt Schlevogt glassworks owned by Curt Schlevogt and his son, Henry. Henry innovated a new glass technique with the appearance of marble, malachite and lapiz lazuli. Then he hired leading artists and sculptors to design his new pieces. At the 1937 Paris World’s Fair, Schlevogt’s marble-like glass was featured in ornamental sculptures by Ena Rottenberg and Josef Bernhard, winning, in part, the Grand Prize for the Czechoslovaks. Both art nouveau and art deco styles are represented in this collection, including the popular, “Ingrid” art deco line. Henry Schlevogt married Charlotte Hoffman, the daughter of another glass producer, Henry Hoffman. Charlotte died while giving birth to their child, Ingrid, for whom the line is named. At the end of WWII, the Schlevogt glassworks were nationalized and Henry was sentenced to prison in Siberia for four years. After release, he was exiled, but began again, directing a glass factory in France until his death in 1984. The Antique Glass Club sponsorship includes not only the two new display cases, but also expert advice and research help with the artifacts. The Antique Glass Club was organized in 1963 by Mrs. Harvey Watkins, and its first president was Mrs. J. E. Johnson. The club, which currently has 24 members, aims to preserve an interest in antique glass and the history and stories it reflects. The club's officers are Carolyn Coufal, president; Gail Wical, first vice president; Beverly Kermode, second vice president; Angela Peik, secretary; and Nancy Smith, treasurer. Start your Holiday Season with a cup of Christmas cheer and beautiful live music at our annual Christmas Open House! The Temple Recorder Society will open the evening with a beautiful repertoire including Christmas favorites, Renaissance period pieces and everything in-between. Ralph Milek and Willard Dyer will bring all of our beloved accordion polka tunes and sing-a-long favorites. 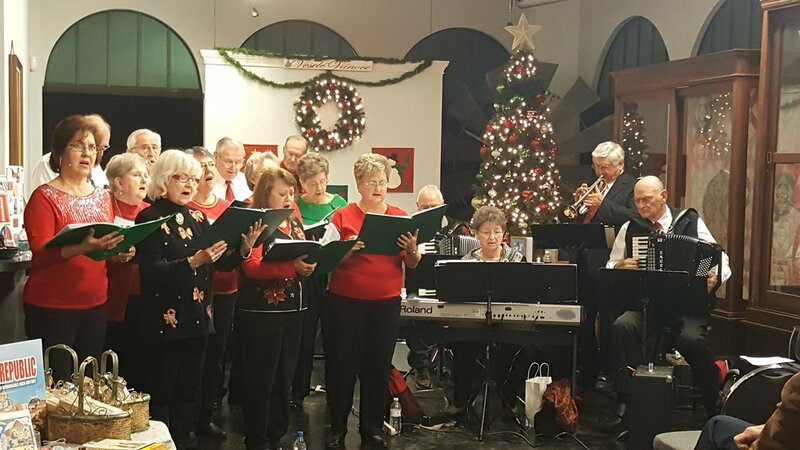 The Taylor Czech Chorus will bring Czech and Christmas tunes to share for a lively and fun finale. Join us for a relaxing evening of fun and fellowship. The Czech Heritage Museum will offer two classes in September focusing on Czech grammar and usage. These classes will begin at 7 p.m. on September 14 and on September 28 at the Museum, 119 W. French Avenue. Doors open at 6:30 p.m.
First Lieutenant Ethan Gleue of Fort Hood will teach declination and the use of the cases, perfective vs. imperfective verbs first. But, if time allows, he will offer help with any other principles the class requests. A donation of $7 per person is requested with all proceeds supporting upcoming World War I centennial exhibit at the Museum.